Who doesn't love a whole chicken for dinner? 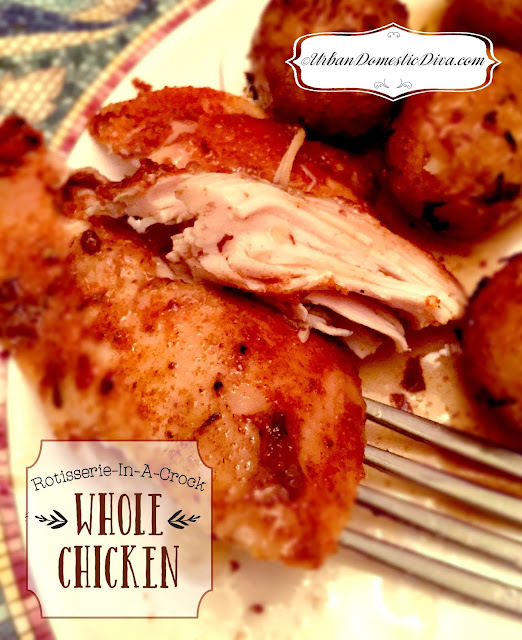 I love the way it smells as it roasts, and I love the amount of food it makes, giving us some great chicken leftovers to use in another recipe-like a salad or pasta dish, or even a casserole. We are busy, right? SO if we can do healthy leftover shortcuts to make our lives a little easier, why not? Well, I took the simplifying mission one step further and a year ago, I started playing around with roasting a chicken in the slow cooker. Nothing is easier than using a crock pot. and I had a pretty good recipe I shared back then. But after doing more reading and playing this year, I am happy to report that I have perfected the roast chicken in a crockpot. This recipe beats a store-bought rotisserie chicken hands down. If you want to crisp up the skin, just throw it under the oven broiler for 5 minutes while you finish up the gravy. Easy-peasy. If you have the forethought, you can also throw the whole chicken in a salt brine the night before to keep things even moister-but it really doesn't need it. If I am home while this cooks, I will baste it once in a while when I pass by the crockpot to do a chore. Otherwise, throw it all in there and forget about it until dinner time. Give yourself a little time to prep the gravy and whip up some sides while kids set the table, but other than that, EASY. Loosen all the skin from back and front of the chicken. I also snip the skin on the legs, and use that hole as a way to get my fingers under the skin to loosen it and get the spices under the skin. Rub the spice mix all over the chicken under the skin, back and front. Reserve about 1/3 of the spices for the top of the skin. Take the onion quarters and place in the chicken's cavity. In the crockpot, place three balls of tinfoil at the bottom. Spray the liner with nonstick cooking spray. Place chicken on the foil. Drizzle top with olive oil, and then rub the remaining spice rub right on top of the skin, all over. Cover and cook on low for about 6 to 8 hours. Usually by 6 hours, with my crockpot, it's done. You don't want a chicken to totally fall apart so that you can't carve it. You are looking for an internal temp of 160°/165˚. Place the chicken on a carving board to rest then carve. You can broil the chicken for about 5 minutes to crisp up the skin if you wish. You can take all the juice at the bottom of the crockpot and skim off the fat, then boil it down. Once it's reduced by a third, mix in a little cornstarch in some hot juice to make a slurry then add it to the rest in the hot pan and whisk to thicken and make a pan gravy. Serve with the chicken.